Austrian architecture and culture is often equated with magnificence. Anyone who visits Vienna cannot help but marvel at its many beautiful Baroque buildings, the grandeur of the Hofburg palace, the exquisite culture that gave the world Mozart and Strauss. An air of refinement is pervasive. Conversely, Austrian rule was something altogether different, especially on the empire’s fringes during the 18th and 19th centuries. There was a rage for standardization and control, the imposition of imperial culture, all in the name of civilization. Austrian officials believed it was their mission to bring order and structure to Eastern Europe, no matter the cost in human or financial terms. This was especially true in the newly acquired province of Galicia, which was annexed following the first partition of Poland in 1772. 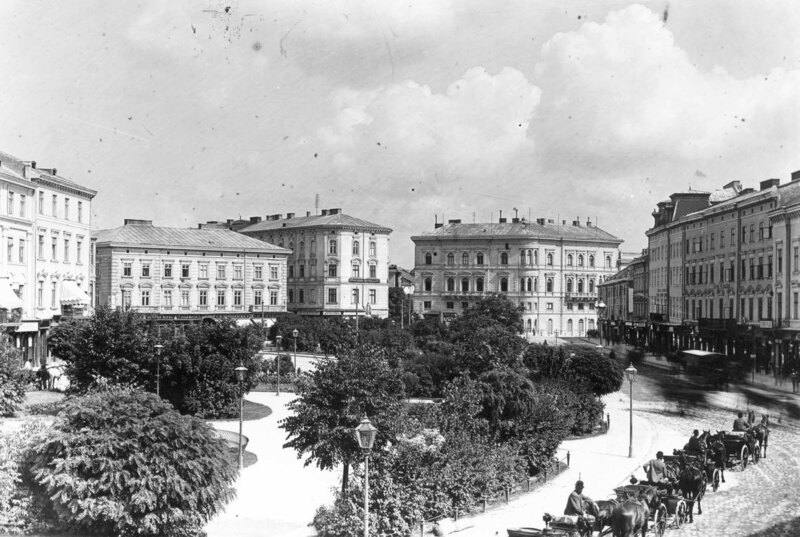 The Austrian rage for order can be understood in the changes that Habsburg rule brought to Lviv (Lemberg in German). This happened most prominently in Rynok Square during the decades after the Austrians took control of the city. Today the buildings on the northern side of Rynok Square are lively and colorful, they add to the festive atmosphere of the square. 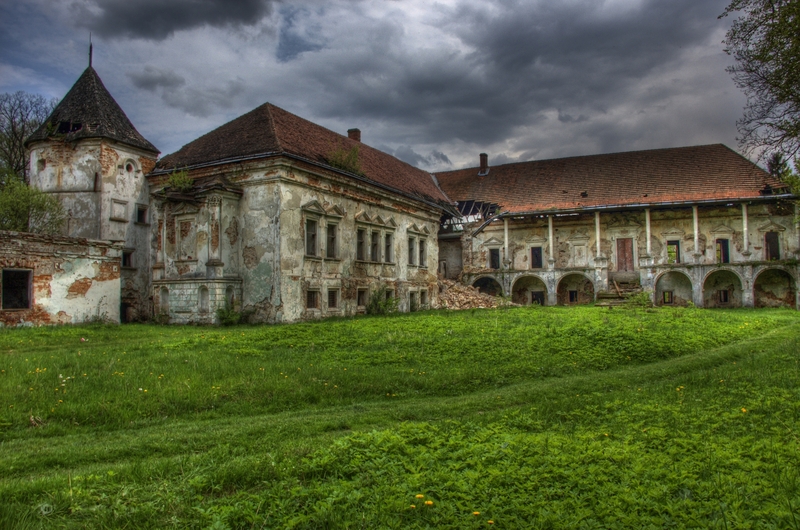 It is hard to believe that by the mid-18th century most of these buildings were in various states of disrepair, with many abandoned and several on the verge of collapse. Then the Austrians took charge, bringing a much needed boost in new ideas. Slowly the northern side came to back life. An architectural rebirth with the Baroque style began to take hold. 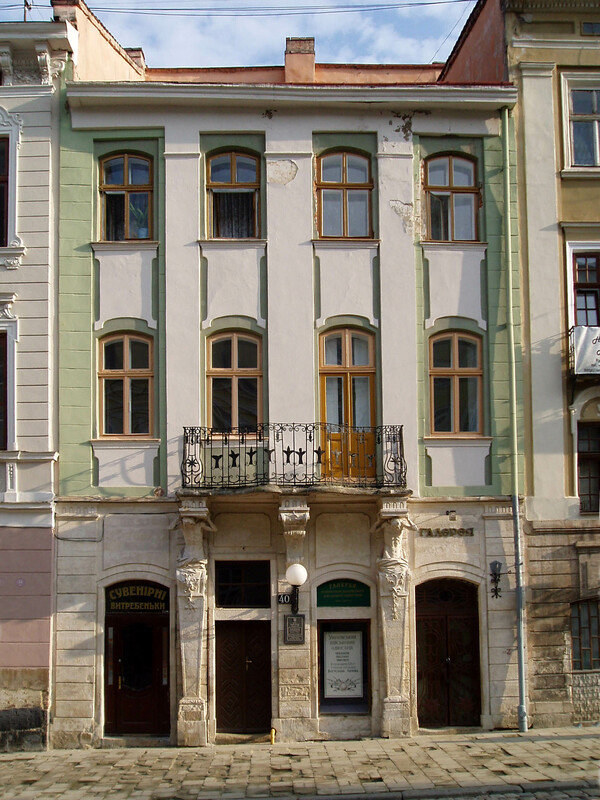 Take for instance the building at Rynok 40, known as the Zukhorovychivska Townhouse. 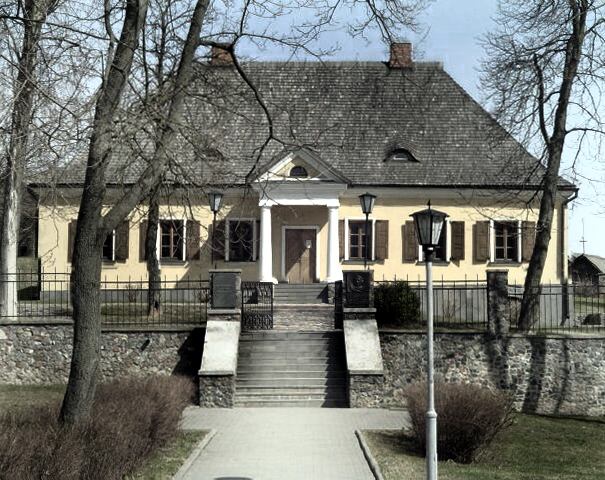 In 1771, a year before the onset of Austrian rule, the house was bought by a postmaster named Anton Dejma. The following year, a reconstruction of the townhouse took place, updating it with Baroque architectural elements. 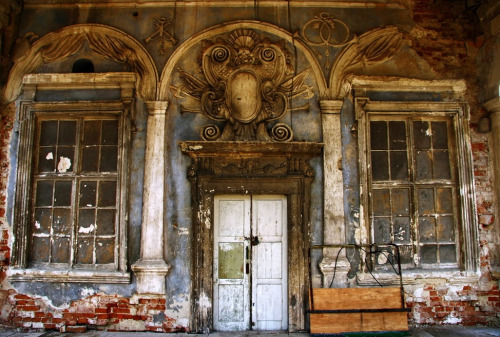 Four doors down at the Boczkowiczowska Townhouse at Rynok 44, another Baroque restyling got under way in the early 1770’s. 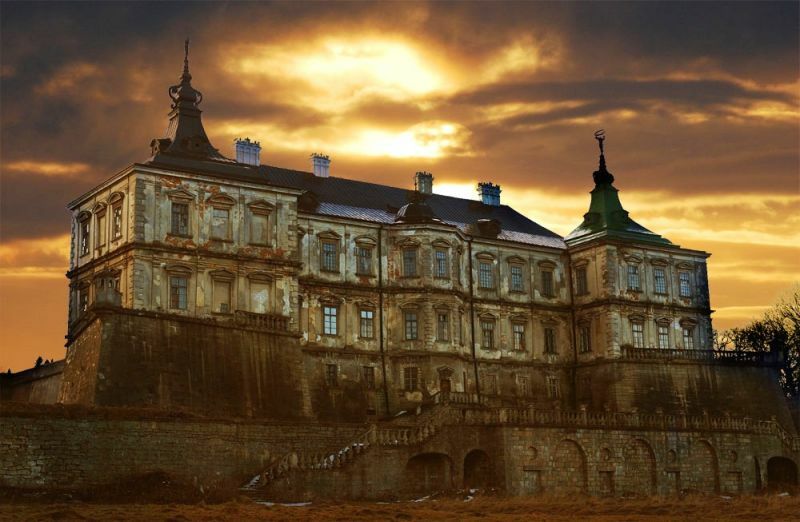 This took place after one of the richest men in Lviv, a physician by the name of Boczkowicz, bought the townhouse. These badly needed upgrades helped revive the square’s northern side, but it would be wrong to assume that the Austrian inspired architectural revival was always a shower of festive enlightenment. The will to control was greater than the will to create when it came to Austrian power in Lviv. The tendency toward standardization influenced the very color of the buildings on Rynok Square. Those brightly painted facades that exist today on the northern side of the square are a throwback to medieval Lviv, when each building had its very own color. This trend was known as Lviv Polychromy. The Austrian administrators banned this aesthetic sensibility and required that all the facades be painted in a dull gray color. The point was to change the look and feel of the city from its former Polish dominated self to a “civilized” Austrian one. Today, this kind of domineering standardization is more associated with Lviv’s Soviet era, but though their ideologies greatly differed, both empires shared an urge to impose their will on many aspects of the city’s look and feel. Trends change and so do empires. Unlike the Soviet era which only lasted forty-nine years in Lviv, the Austrian period was three times as long. At nearly one-hundred and fifty years, this time span meant that the dynamic influences of changing artistic and architectural movements such as Neo-Classicism could take hold in the empire. Such trends made their way to Lviv and were showcased in Rynok Square. A series of sculptures featuring classical mythological figures and elegant fountains were installed there in 1815. They adorned the same exact places that the square’s wells had been located. The limestone sculptures allegorically portrayed Diana and Adonis representing earth, and Neptune and Amphitrite representing water. The Imperial Austrians were aligning themselves with the classical world. They saw themselves as the modern version of a higher form of western civilization. This was to be shared or some might say imposed upon the most far flung provincial cities of the empire such as Lviv. The saying that every crisis is an opportunity aptly describes the cosmetic surgery Austrians did at the heart of Lviv. 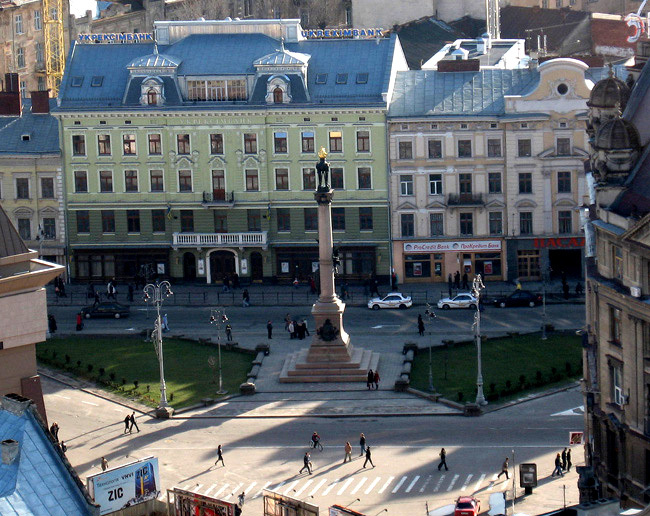 The Austrians took full advantage of the greatest disaster Rynok Square experienced in the 19th century to give it a transformative makeover, one that continues to inform how Lviv’s most important public space is seen and experienced today. On a mid-summer’s day in 1826, the Rathaus, (the German word for Town Hall) collapsed. The most important building in the city was destroyed. The nerve center of the Austrian administration had to be rebuilt. The next iteration would be reimagined in an imperious and imposing style. 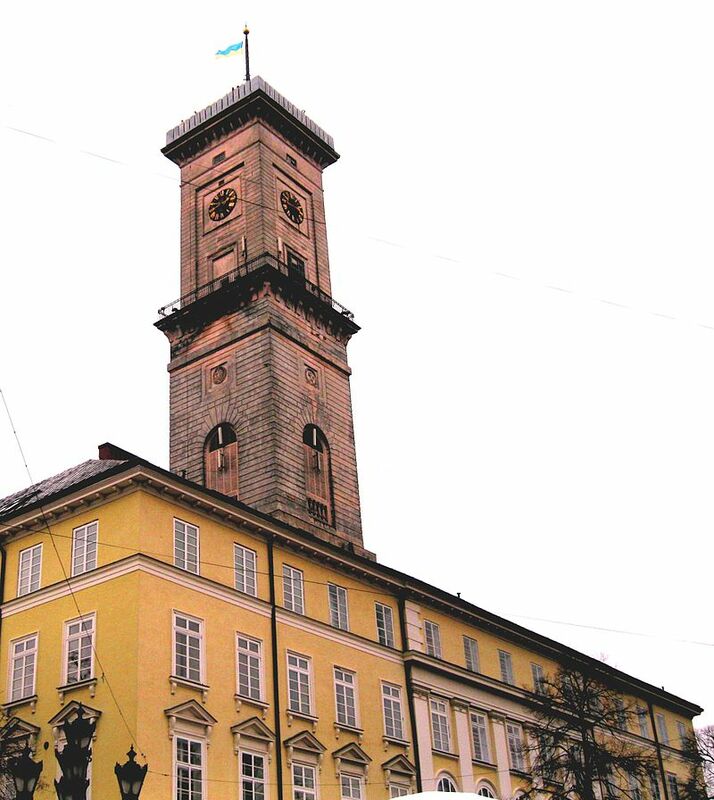 Today, locals in Lviv often refer to the Ratusha (the Ukrainian word for Town Hall) as “a huge and hideous chimney.” As a friend of mine, a native of Lviv, once told me while pointing out the Town Hall (Ratusha in Ukrainian), “it is nothing special.” Architecturally speaking that is true, but Austrian officials were thinking in terms of administration, rather than aesthetics. The Rathaus was and still is today an embodiment of Imperial Austrian bureaucratic architecture. The construction took eight years, which is not all that surprising since the building contains 156 rooms and 9 meeting halls. Each of its four sides have symmetrical façades. Its square tower, like the rest of the structure, has little to recommend it from an aesthetic viewpoint. The building was meant to be big, not bold, to be functional, not fashionable and act as a symbol of Austrian authority. It did all of these things rather well, a triumph of substance over style. The construction of the new Rathaus also meant a reconfiguring of the area surrounding it. Houses that had once stood close to the northern side of the old City Hall were leveled as was the square itself. New cobblestones were laid. Rynok Square was now more manageable, more controlled. To the Austrians, order had been made from chaos. The square was now a civilized public space. The first Habsburg Emperor to visit Lviv was Joseph II in 1773. 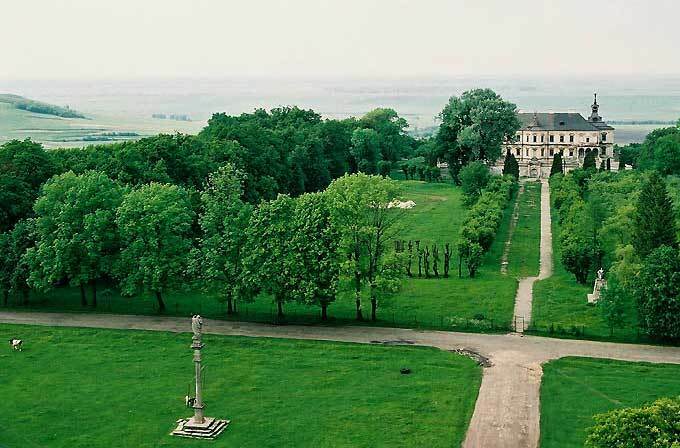 On August 1st he wrote his mother and co-ruler, the Empress Maria Theresa, a letter from Lviv in which he said “I already see in advance that the work will be immense here.” And so it was. It took the Austrians over sixty years before they finally got the look and feel they wanted in Rynok Square. By the 1830’s it had been brought into the early modern age and was now an imperial city at its heart. Rynok Square had become Austrianized, its look and feel has largely stayed that way ever since. 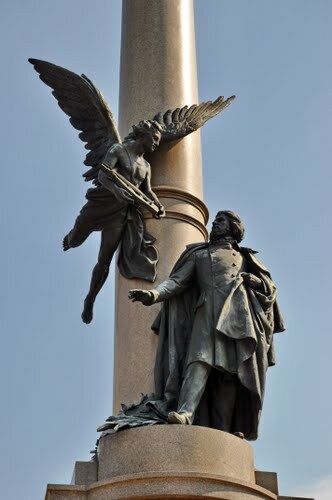 Polish sculptor Antoni Popeil designed what many now call the best Mickiewicz monument in Europe. Popeil’s vision called for a column 21 meters in height, surmounted not by Poland’s greatest poet, but by a flaming torch symbolizing the idea of inspiration. Further down the column stood a 3 meter tall sculpture of Mickiewicz being given a lyre (a metaphorical reference used to show a poet’s skill) by a winged angel, the genius of poetry. The column would be constructed with Italian granite from Milan, the foundations would be granite and the figures cast from bronze. 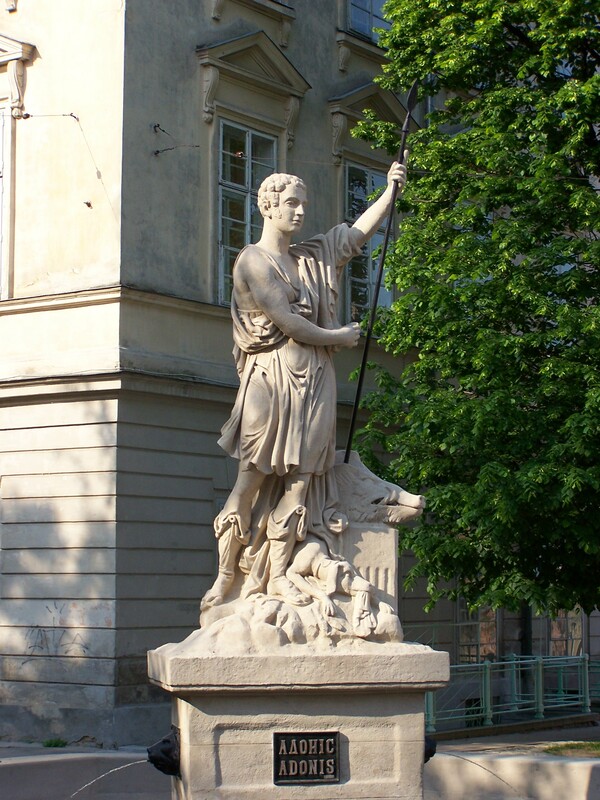 Popeil had been educated in the Fine Arts in Lviv, Vienna and Florence. He was a highly accomplished artist whose creative talent was nearing its peak. The design may have been done, but the monument was far from completion. Funds would have to be raised in order to pay for the column. Among the fundraising activities that occurred were theatrical and musical performances, the latter featuring works from famous Polish composers. Jubilee chocolates, stationary and commemorative postcards were all sold to cover construction costs. The city and local population chipped in with important monetary contributions. At this time, 49% of Lwow’s population was Polish and an even greater percentage were Polish speakers since much of the city’s large Jewish population spoke the language. Lwow’s aristocratic and middle classes rallied around the building of the monument. The Mickiewicz column was in essence a Polish monument. The monument was finally unveiled at a grand ceremony on October 30, 1904. Thousands were in attendance at the event. The city set aside 20,000 crowns for expenditures. Visitors came from as far away as the cities of Krakow, Stanislaw (Ivano-Frankivsk) and Chernivtsi. None other than Mickiewicz’s oldest son, Wladyslaw was in attendance. The festivities lasted two days with a wide range of events. The ceremony was a signal success. The column was now well on its way to becoming one of the most memorable landmarks in the city. The monument somehow still occupies the same place today as it did in 1904, despite the fact that it was witness to no less than four wars, two of which were among the most violent in human history. In a bizarre twist, the square in which the column stands was given Mickiewicz’s (Mitskevycha in Ukrainian) name by perhaps the most anti-nationalist regime of the 20th century. 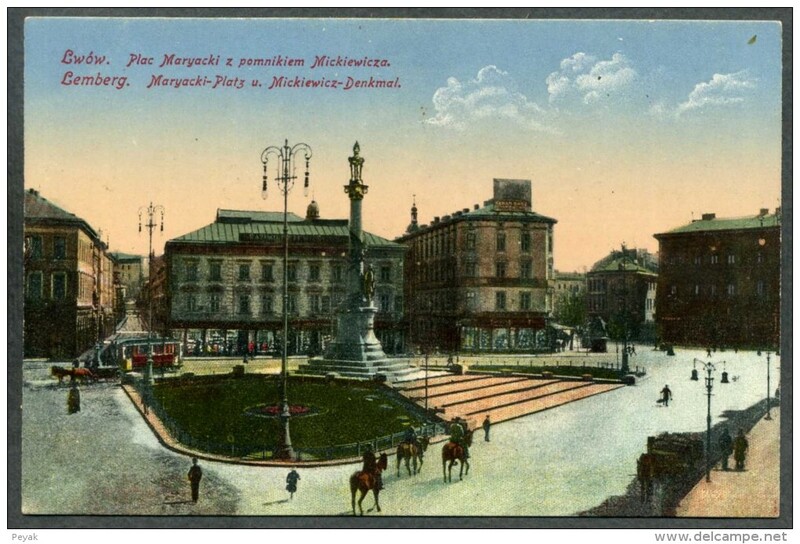 After the militantly atheist Soviets occupied the city in the latter part of 1939, they took down the St. Mary sculpture which had adorned a fountain near the Mickiewicz column. They then renamed the square for the great Polish poet. This was done despite the fact that all the while they were carrying out a murderous persecution of Polish intellectuals and crushing nationalist resistance. The renaming stuck. What vanished instead were the Poles of Lwow. As late as 1944, a majority of the city’s population was ethnically Polish. In the aftermath of World War II somewhere between 100,000 to 140,000 Poles were forcibly relocated to what had once been Eastern Germany, but was now Western Poland. Demographic statistics give a bleak summary of the changes that were undertaken in Lwow. The proportion of Poles in the city dropped from 63% in 1944 to 10% in 1950 to 4% in 1959. Poles did the same thing to Ukrainians in what is today southeastern Poland, but they attempted to resettle and assimilate them (i.e. make them Poles) in the northern and western parts of Poland. Today ethnic Poles are less than 1% of Lviv’s population, but they certainly make up the greatest number of tourists visiting what was once known to them as Lwow. 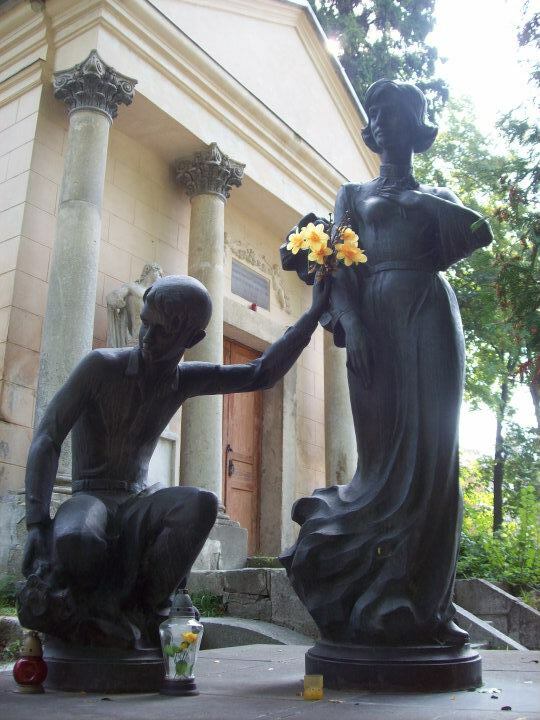 The Polish language can be commonly heard on a summer’s day in the center of Lviv. A city largely defined by Polish culture for several centuries, now only has Polish visitors, monuments and architecture to show for their once outsized presence. The defining symbol of Polish national feeling still stands with the Mitskevycha column at Mitskevycha Square. If the column has made it this long it is most likely to stay. Anti-Polish feeling in western Ukraine has waned, especially in the face of a growing Russian threat in Eastern Ukraine. The Poles have been strong supporters of Ukrainian sovereignty and independence. Old historical wounds from the World War II era have slowly begun to heal. Mickiewicz is still a symbol of Polish nationalism, but with modern Poland’s increasingly friendly relations with Ukraine, there is no longer a feeling that the monument is an imposition. Now it feels more like a tradition, one that surges through the past and into the present of this beautiful city. Nevertheless, Poles and Ukrainians look up to the column today with very different feelings. To Ukrainians, Mickiewicz and Lwow are a thing of the past. To Poles, Mickiewicz and Lwow continue to be part of who they are. For a man who never visited Lviv or as he would have called it, Lwow, Polish poet Adam Mickiewicz sure has a lot of staying power in the city. Mickiewicz is revered as Poland’s greatest bard, a man whose name is synonymous with Polish romantic nationalism. Among his many literary accomplishments, he composed its epic national poem, Pan Tadeusz. His words and deeds have been revered by patriotic Poles ever since the mid-19th century. 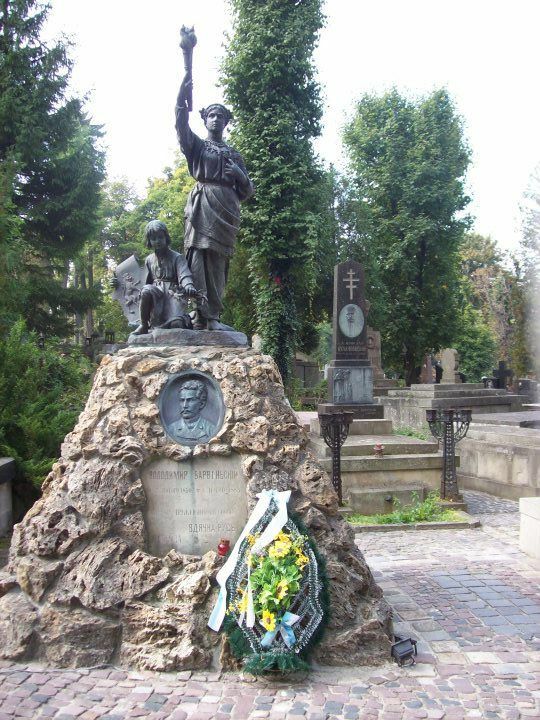 Because of Mickiewicz’s well-deserved reputation it is quite strange that one of the finest monuments ever constructed to honor him still stands today in Lviv. 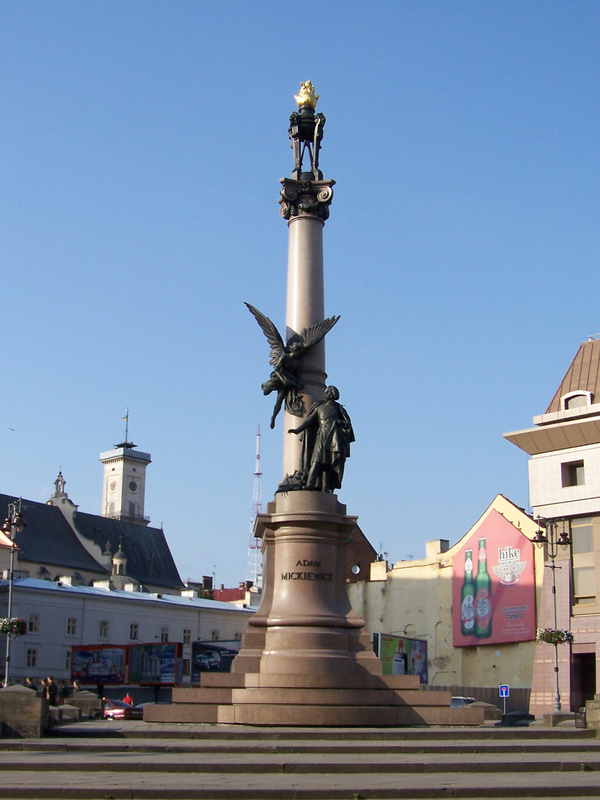 Placed close to the city center, visible to tens of thousands of Ukrainians that pass by the area on a daily basis, the Mickiewicz column as it is known soars above the urban masses. Even stranger is the fact that Lviv’s Mickiewicz column survived Soviet, Nazi and another Soviet occupation of the city. The fact that it still stands today in a city that now has only a smattering of Poles is nothing short of improbable. 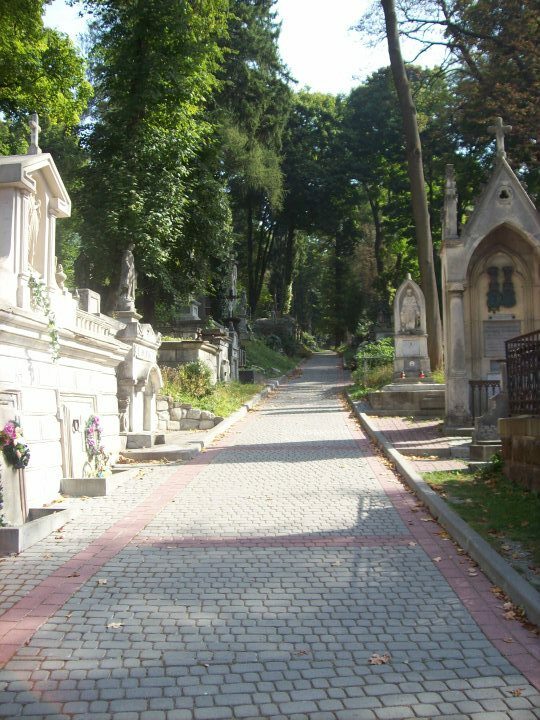 To discover Mickiewicz at the heart of what has been called “the most Ukrainian city in the Ukraine” is a strange and fascinating find. During the late 19th and early 20th century nationalism was rising all across the Austro-Hungarian Empire. As the Habsburgs tried to keep their empire from splintering into many disparate constituent nations they allowed certain ethnic groups to celebrate their own languages, customs and heroes. Ethnic Poles in the Kingdom of Galicia and Lodomeria (present day southeastern Poland and western Ukraine) were allowed self-government. This freedom helped lead to a Polish national revival. Poles controlled the provincial administration in Galicia and were virtually autonomous. They also had the weight of numbers on their side. They made up a majority of Galicia’s inhabitants. In Eastern Galicia the story was different. Poles were the majority only in the city of Lwow (the city was officially known at this time by its German name of Lemberg), Ruthenians (same as Ukrainians) were a large majority of the rural population. Polish dominance of the growing city of Lwow was good enough though, since it was the home of social, economic and political power in the region. Because of this, it is little surprise that the Poles decided to raise monuments in honor of an exalted national hero in the city. The year 1898 was slated to be a special one for Poles memorializing Adam Mickiewicz. It was the one hundredth anniversary of his birth to a family of impoverished gentry in what is today Lithuania. 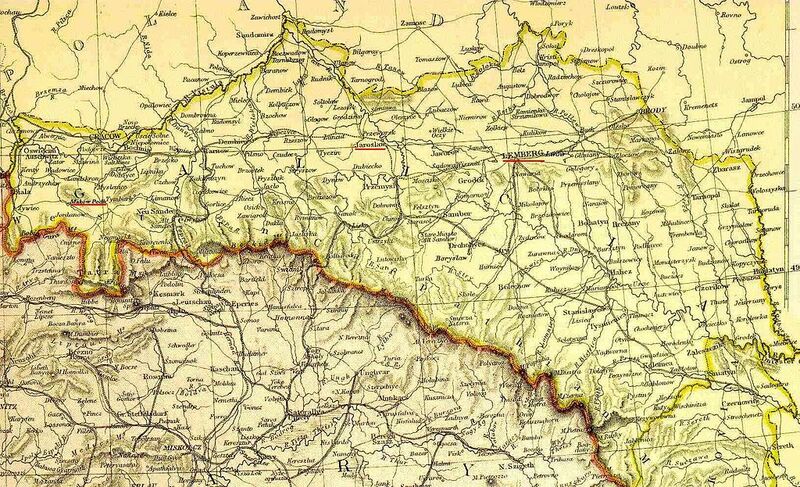 At that time, the region had just become part of Russian ruled Poland. Mickiewicz would spend his entire life fighting for a reconstituted Poland. This led to a literary life lived largely in exile, first in Russia, then France, Switzerland and back to France. Eventually he would die far from his beloved Poland while in Constantinople. One place Mickiewicz did not live was Galicia. The only time he made a trip into Ukraine was on his way to Crimea during his exile in Russia. 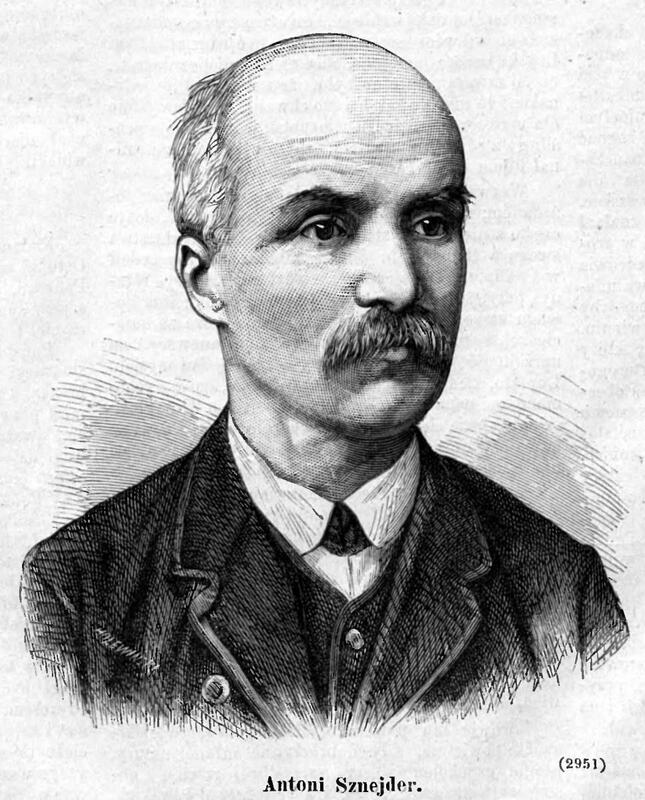 Nevertheless, Poles in Galicia had their imaginations captured by his patriotic verse. They may have been split from their fellow Poles by the partitions, but Mickiewicz’s words united them. 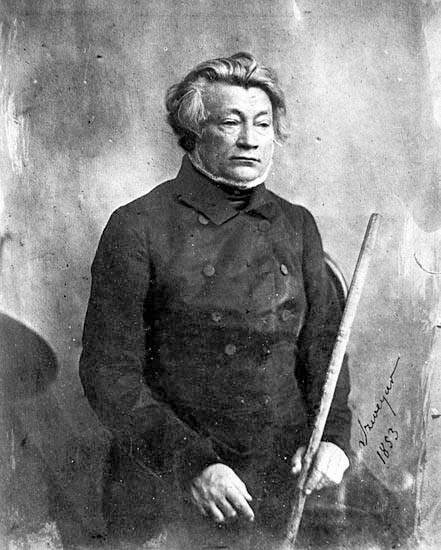 Following his death in 1855, Mickiewicz’s fame continued to grow. Austrian Galicia was home to millions of Poles who revered his life and work. It was also the one region where Poles were given a generous amount of freedom to express their culture. Lwow became the epicenter of a surge in Polish nationalism. The first proposal for creating a monument to his memory in Lwow was in 1856, a year after Mickiewicz’s death. It would be almost a half-century before the idea finally came to fruition. Just over four decades later a committee was formed in Lwow to oversee the design of a monument to honor Mickiewicz. To show just how revered a figure the poet was, the committee decided that the winning design would be placed on Mariyska Square (St. Mary’s Square) in the city center. A sculpture of St. Mary, known as the “Mother of God”, that already inhabited the site would be moved to another area of the square to make room for a Mickiewicz monument. The committee soon announced “a competition for a monument project. The main motif of the monument should be a column in honor of the poet and built on Mariyska Square of our city. The monument must be no less than twenty meters in overall height, and must be made from material that can withstand all changes of our climate – either red or grey granite, whichever the Committee supplies to the artist. In the end, the cost of the monument should not exceed 60,000 golden rynskych, including the material which the Committee will supply. Models or drawings, made to an overall scale of 1:3, should be sent by September 15 of this year. The first prize is 1000 crowns, and the second is 500 crowns.” The winner did not disappoint. The Kingdom of Galicia and Lodomeria, it is a name that gleams and sparkles while rolling off the tongue. The name conjures up images of castles and manor houses, a quasi-magical land. The reality could not have been more different. The Kingdom existed from 1772 to 1918 as part of the Austrian Empire and then as part of the Austro-Hungarian Empire. For nearly a century and a half it was a byword for backwardness and poverty, the opposite of modernity. To a great extent such a reputation was spot on, but the wild ideological swings, violence and tumult that befell the area following the Empire’s disintegration made many look back at the Kingdom as a force for good rather than repression, an island of stability in a region that experienced constant upheaval. The truth was rather different, more complex and rather depressing. Where did that glittering name, the Kingdom of Galicia and Lodomeria come from? It was largely artificial, just like its borders. The idea of a kingdom sounded good, but was really a misnomer. The title implied independence, but there was no stand-alone Kingdom. Put simply, Galicia and Lodomeria were Latinized versions of the names Halychyna and Volyn, the historical regions that made up the territory. Located in what is today southeastern Poland and western Ukraine the territory was taken by the Habsburgs during the First Partition of Poland in 1772. The name they gave it may have been impressive and lent a veneer of sophistication, but it did not change the true nature of the place. The name was symptomatic of what the Habsburgs wanted the place to be, rather than what it was. In 1772 the newly created kingdom had a diverse and complex population of 2.2 million. The aristocrats were Polish, the peasants either Mazurians (Poles of Western Galicia) or Ruthenians (Ukrainians), the Jews low level merchants or poor farmers and ethnic Germans the administrators of this ethnic mix. The aristocratic element made up about 3% of the populace, while the overriding majority of the population consisted of peasants who worked, but had little control over the land. In the late 18th century, seven out of every ten inhabitants of the kingdom were serfs. Rural backwardness was endemic to the region. In actuality, Galicia was not the poorest part of the Austro-Hungarian Empire when it came to income. Eastern Hungary had a lower average income per person, but Galicia’s personal income level was not much higher. It was on par with Transylvania. This is deceptive. Average income is just that, an average. Income of the elites can pull the average up. The major difference between Galicia and a place such as Transylvania was that the latter had large tracts of inhospitable, mountainous land with its more fertile areas plagued by an extremely short growing season. Conversely, Galicia was blessed with bountiful land, an astonishing 96% of which was considered productive. Half of the province contained rich black earth, ripe for agricultural fertility. Unfortunately, the archaic socio-economic system made the entire province a developmental disaster. Caught up in this disaster were its people. At the top of the pecking order were the landed gentry, a ruling class made up almost entirely of ethnic Poles. They controlled the most fertile agricultural land and almost all of the forests. In the mid to late 19th century they also managed to gain control over the political apparatuses of the province. Following the defeats of Austria in Italy in 1859 and the Austro- Prussian War of 1866, power was decentralized in order to keep the empire from falling apart. Galicia was given a wide degree of latitude in managing its own affairs. The Polish ruling class took advantage of this to entrench their power base. All laws made in the province were almost entirely to their benefit. Language laws were constructed to benefit the Poles. 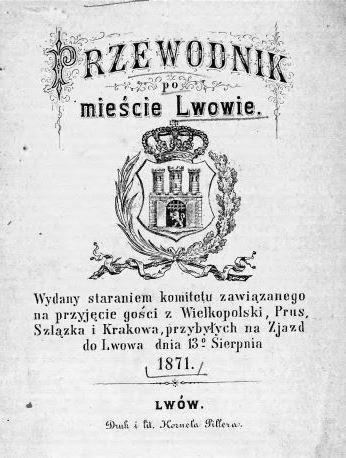 In 1867 the official language of the schools became Polish, 1868 it became the official language of the courts and then in 1869 the official language of the province. That did not mean that all Poles were aristocrats, far from it. In western Galicia, a majority of the Polish speaking population were peasants, but Polish speakers, whatever their socio-economic status had many more opportunities. 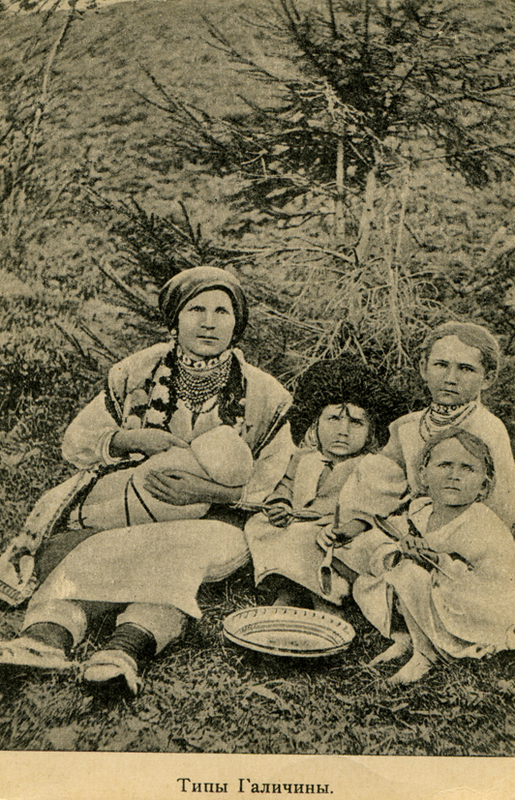 Eastern Galicia’s population was made up of predominantly Ukrainian peasants. In the first decades of the 20th century “only” two-thirds of Galicia’s Poles were involved in agriculture, whereas 94% of Ukrainians were still working the land. Meanwhile hundreds of thousands of Jews lived in towns and cities or immigrated. Many Jews were involved in money lending, which made them especially reviled by the impoverished peasants who became deeply indebted to them. They took out loans in order to survive, but often ended up losing the only thing they owned, land. What was a peasant without their land? In Galicia that was a question no one, ruling class nor subjects, could answer.